Running on Prince Edward Island. 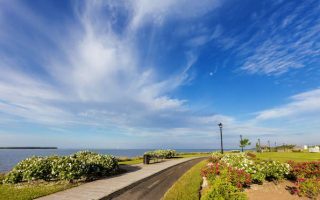 Best routes and places to run on PEI. 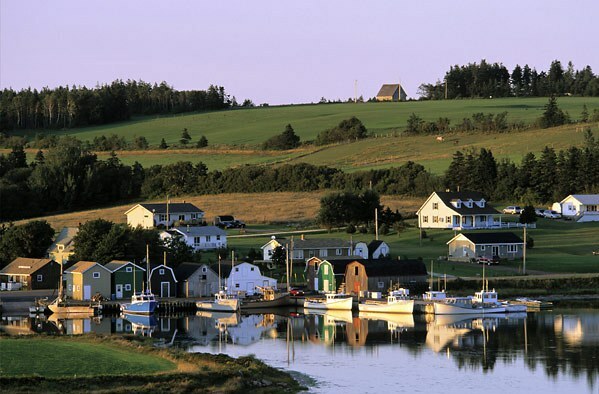 The smallest of Canada’s Maritime provinces, PEI is a popular visitor destination in summer, known for its pastoral scenery, red soil farms, and gorgeous beaches. The island is about 225 km east-west and 75 km north south. There’s great variety for running on Prince Edward Island. 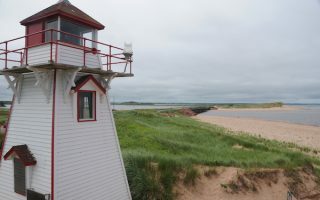 On the northern side, the shore-side paths between North Rustico and Cavendish and between Brackley Beach and Dalvay offer wonderful views. 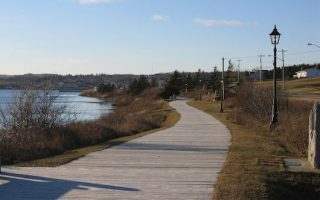 The Confederation ‘Rail Trail’ runs the length of the island, with several spurs. 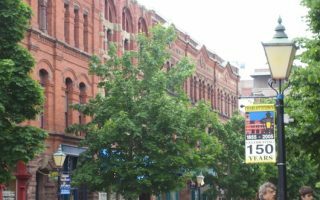 You can run along the boardwalk in popular Summerside, or on the waterside piers and gracious streets of the capital city of Charlottetown. The area around Saint Peters Bay has some excellent running options. 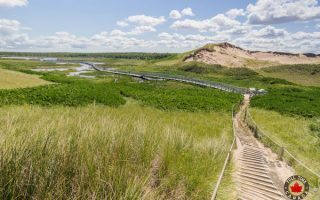 In PEI National Park, we love the trails through the dunes in Cavendish and Greenwich. For the best beach running, head to the red sand beaches on the southern side of the island. The Scenic Heritage Roads — red clay lanes running by farmsteads and featuring tunnels of trees — are also a pleasure for running. 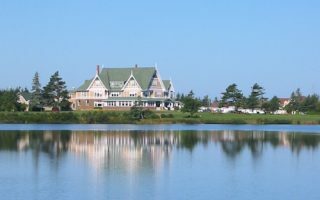 PEI is accessible by plane, ferry, or the Confederation Bridge from New Brunswick. Once on the island, a car is needed to get around. Summers are mild and pleasant. Autumn features gorgeous colors and stretches to the end of October. Winters are cold and stormy, averaging 112 inches of snow. A 7.5 km 'runseeing' tour of the historic capital of PEI. It's a great combination of older government buildings, historic parks and squares, Victorian homes, fun shopping streets, and several pleasant sections along waterfront paths and boardwalks. 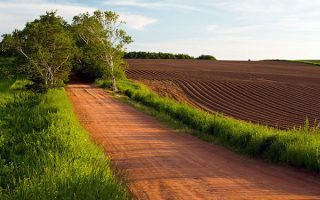 The preserved red clay lanes known as Heritage Roads are a unique feature of PEI. Some of these roads run by open farmland, and others feature beautiful 'tunnels of trees'. See the map with detailed information, including location & distances. The red sand beaches on PEI's southern shore are better for running than the white sand beaches on the northern shore. Some of the favorites for running include Argyle Shores, Canoe Cove, and Chelton Beach, and Tea Hill. The waterfront boardwalk makes for a great run in PEI's second largest city. It runs about 4 km from Mackenzie Dr. until a point where Water St. turns inland. About 4 km one-way. Great water and harbour views. One of the best water view stretches for a longer run on PEI. Bike path most of the way. The best sections are the 2.5 km starting in North Rustico, along the waterfront, and then 5 km between Cape Rd. and Cavendish Beach. A wonderful paved and boardwalk trail running for 2.3 km through spectacular dunes. 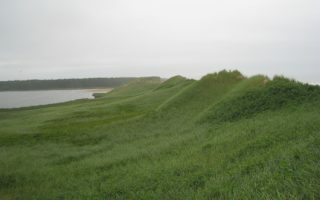 One of many other running options in the Cavendish section of PEI National Park, with additional trails, beach, and multi-use Gulf Shore Way trail to North Rustico. Another good option for a long off-road run in PEI. Up to 15 km one-way. The bike path goes in and out of water views. Best sections for running are the 4 km on Robinsons Island Rd., and the 5 km between Brackley Beach and Stanhope by the Sea. Three great options for running in this area: Greenwich Rd. 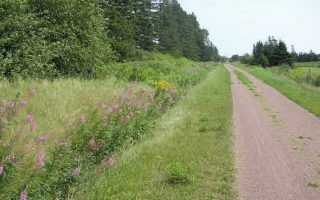 from Saint Peters Bay to Greenwich, wonderful dunes trails in the Greenwich section of PEI National Park, and a scenic section of the Confederation Trail from Saint Peters Bay to Morell. 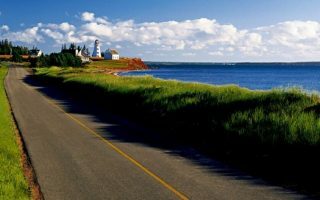 The bike path along Covehead Bay is one of the prettiest spots to run on PEI. Great views of the water, and then pleasant greenery as you pass by the Stanhope Golf Club. It's 4.7 km one-way from the Covehead Harbour Lighthouse to Rt. 6. Historic town and site of a popular summer road race. We've mapped the 5k course, along the water, through a park, and along a beach, making for a nice tour of this town on the eastern part of the island. A wonderful run over a causeway, with views of St. Mary's Bay on one side and the ocean on the other. 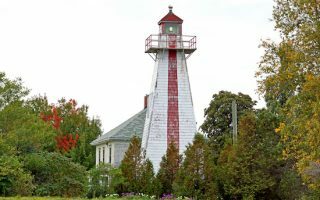 The first 3 km from the Provincial Park is especially scenic, with a spur out to a lighthouse. 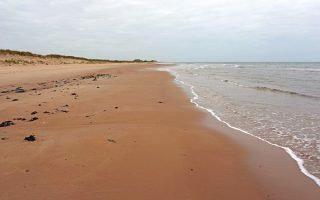 One of the most popular white sand beaches on PEI. PEI has mild, pleasant summers and cold, snowy winters. Summer is the popular visitor season, with average July high temperatures of 23C (74F), with cool-ish nights — bring a layer. It can be overcast and rainy in summer. Extreme heat is rate. Autumn extends well into October and is gorgeous. Winters are cold and can feature frequent Atlantic storms. The island receives 285 cm (112 inches) of snow annually. Bring the right gear and YakTrax. Owing to the cold ocean waters, spring can be a long time coming and cooler than one would expect. One note: owing to the Gulf influence, the ocean waters in summer are the warmest north of the Carolinas. Running Room in Charlottetown is the one major running store on the island, offering a good selection of gear. They have group runs Wedesdays 6pm, Saturdays 10am, and Sundays 8:30 am. The PEI RoadRunners Club is quite active, with group runs and several running events. Excellent Running Events Calendar listed by the PEI RoadRunners Club.